It's all about parenting, literacy, creativity, and having fun with your kids while making life and learning more meaningful. the power of writing is in everything we do and is divine to occupy. Terrific and informative post for the W Day! Hope your week is going well! Enjoy! It's true. I'm at lunch, at work. I work better with familiar music (if it has lyrics). Instrumental music interferes less. When I blog, there's almost always music. Why does this NOT surprise you? Very informative post! My children like reading and my eldest daughter won twice a prize at school for writing. The first time she was 8 and the second time she was 11. Now she is an engineer and doesn't write anymore. My Australian daughter wrote a book about the Aboriginal uncle of her first husband. Actually he told the story of his life and she recorded it and when she came home she and her friend wrote the story on the computer and printed it. Her children like reading and I believe one of them writes stories too. I forgot to tell that the Wizard left Christchurch after the earthquake and turned up on the North Island and even came at one of Ann's parties, so she told me in her comment. I always find it interesting to listen to authors talking about their work, and I've spent some interesting hours in the company of the voices you've chosen. I wish I could write better. Maybe I should check the book out at the library. 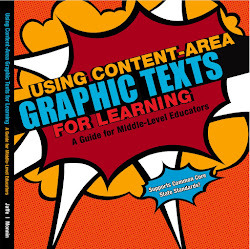 Check out my monthly column, Using Graphic Novels in Education (http://cbldf.org) highlighting graphic novels and educational skills and tools they offer along with specific lesson suggestions. What are Perceptual Motor Skills and How Do I Get My Kid Some?